The Kentucky General Assembly this week passed new incentives for plants to make synthetic fuel from coal, over objections of Appalachian residents who said the bill, among other things, would lead to more strip mining of coal through mountaintop removal. But their pleas did find some receptive ears, writes Ronnie Ellis, the Community Newspaper Holdings Inc. correspondent in the state capital of Frankfort. "Tom Fitzgerald of the Kentucky Resources Council . . . warns a day of reckoning is coming when mandated reductions in carbon emissions which are warming our planet will dramatically increase the costs of coal-generated electricity. Lawmakers respect Fitzgerald, courteously listen to him, and then vote against his counsel. At least they listen. And this week, it appeared others got through to lawmakers about the devastation of coal mining. Members of the Kentuckians for the Commonwealth were eloquent and moving in their condemnation of coal and its effects on their lives and the environment – eloquent enough that several lawmakers asked to go and see for themselves." 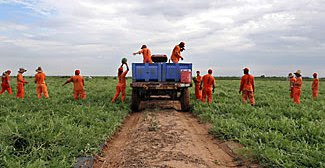 For $2 an hour, low-security inmates convicted of nonviolent crimes harvest watermelons in Arizona, where farmers have been using prison labor for almost 20 years. The demand for the inmate workforce is growing as state and federal governments crack down on the use of undocumented workers, writes Nicole Hill of The Christian Science Monitor (who took the photo). Robert E. Murray has become a household name since the accident at his Murray Energy Co.’s Crandall Canyon Mine in Utah on Aug. 6, and with that recognition has come increased scrutiny from major newspapers. We hope smaller newspapers and broadcast stations in or near the coalfields do likewise. In The New York Times, Susan Saulny and Carolyn Marshall explore Murray’s record as a mine owner, and they found a history of “run-ins” with government and others over climate change, labor disputes and safety. Meanwhile, miners also die at surface mines. The U.S. Mine Safety and Health Administration has fined Tri-Star Mining $180,000 for violations that contributed to an accident in Barton, Md., on April 17 that resulted in the death of two employees, according to an MSHA release. The two miners were trapped under about 93,000 tons of rock and material when a highwall collapsed in the pit where they were working, an accident that could have been prevented, the agency said. Mountaintop removal — the practice of using explosives to blast away the tops of mountains to expose coal for strip mining — has been used controversially in Central Appalachia "under a cloud of legal and regulatory confusion" for decades, and now has found the support of the White House, reports The New York Times. The Bush administration will approve a new regulation that will allow mountaintop removal to continue and expand, in an effort to encourage mining companies to increase output to meet increased demand, reports John M. Broder. The new rule, drafted by the Office of Surface Mining in the Interior Department, would require only “that mine operators minimize the debris and cause the least environmental harm, although those terms are not clearly defined and to some extent merely restate existing law,” Broder writes. That “environmental harm” is at the forefront of the mountaintop-removal debate, since the mining generates tons of waste that must be deposited somewhere, usually in valleys and headwater streams near mines. The new rule limits the protection of these areas from dumping. “Environmental activists say the rule change will lead to accelerated pillage of vast tracts and the obliteration of hundreds of miles of streams in central Appalachia," Broder writes. Likewise, an otherwise good graphic with the story says, "Coal companies are supposed to reclaim land, but native trees have trouble growing on disturbed topsoil." That implies that only restoration of forest would accomplish reclamation. The law requires only "vegetative cover," and that typically is grass -- although recent research has found that with less soil compaction, trees can be more easily grown on mined land. As the rescue effort at the Crandall Canyon Mine of Murray Energy Corp. in Utah remained halted, leaving six miners trapped and probably dead, The Mountain Eagle in Whitesburg, Ky., continued to offer some of the sharpest criticism about the current state of mine safety in the United States. In this week’s edition, an editorial listed the names of the 63 miners killed nationwide since Jan. 1, 2006, as well as the six miners still missing in Utah. “It's a terrible toll -- 70 miners in all -- and one that should be unacceptable, because fatality-by-fatality reviews show that most of these deaths could have been prevented by a combination of systematic risk assessment, conscientious mine management, diligent regulatory enforcement, and adoption of technologies that are taken for granted elsewhere,” the editorial said. Meanwhile, a friend of one of the miners trapped in the Crandall Canyon mine confronted mine co-owner Bob Murray yesterday at a funeral for one of the three rescue workers killed at the mine, The Associated Press reports. The man "handed Murray a dollar bill" and said, "This is just to help you out so you don't kill him." AP reports, "Murray's head snapped back as if slapped." Here is CNN video. A dog-racing track near Charleston, W.Va., which already has slot machines, hopes to add casino table games following apparent, narrow approval by voters in a countywide referendum -- the third and last such vote in the Mountain State this year, and part of a regional trend that could encourage casinos in Ohio and Kentucky. The state's four tracks, which have had slots for several years, won legislative approval for table games this year, after Pennsylvania authorized slots statewide and Maryland continued to discuss allowing slots at tracks. The only West Virginia county to reject table games was prosperous Jefferson, at the state's eastern tip. The other two approvals came in the Northern Panhandle, close to Pennsylvania. The expansion of gaming in the two states is expected to increase pressure for it in Ohio, where voters have twice rejected casinos, and Kentucky, where Democratic gubernatorial nominee Steve Beshear is pushing for a statewide referendum and leading in polls against Republican Gov. Ernie Fletcher. After Beshear won the primary, the governor dropped his hands-off stance on the issue and said he would fight casinos. This week he launched a television ad campaign built around a recent tour he made to states with casinos. Coverage of high-school sports has long been a staple, and an important audience-builder, for local news media. Now local outlets are getting more competition from national media chains, and they could have an impact in rural areas. "Within days of each other, three media companies . . . launched Web brands aimed at high school sports," writes Katy Bachman of MediaWeek, reporting on the latest site to be announced, by Hearst-Argyle Television, highschoolplaybook.com. "Emmis Communications, partnering with the Indiana High School Athletic Association launched a statewide brand, IHSAAsports.org. Belo [Corp.] launched hsgametime.com in six of its markets, with plans to roll out the site out to all the company’s markets by the end of this month." The Bush administration, under political pressure to show toughness after failure of its immigration bill, says it is cracking down on employers of illegal immigrants. That has helped spread worries about lack of farm labor to harvest crops this year to all corners of the country, including the apple orchards of the Hudson River valley in New York. "There are new fears in New York and around the nation over whether there will be enough hands to pick the crop," Lisa Foderaro of The New York Times reports from Hamptonburgh, N.Y, where Jonamac apples are being harvested in the photo by the Times' Joyce Dopkeen. "While the FBI turns its attention to preventing another 9/11, drug traffickers are exploiting the vacuum. The result: A drug epidemic and related crime wave are plaguing Indian communities," report Paul Shukovsky and Daniel Lathrop in today's Seattle Post-Intelligencer. "White House cuts to the FBI and the Drug Enforcement Administration have been disastrous for tribes -- in part because the bureau in Indian Country acts like a local police department, making the felony arrests," the P-I reports. "Tribal police don't have legal authority to arrest non-Indians or charge anyone with felonies. And the maximum term in reservation jails is one year." The big problem drug: methamphetamine. Justice Department records studied by the P-I show that the FBI has had 27 percent less investigative activity on Indian reservations since Sept. 11, 2001 -- "mirroring the transfer of more than 2,000 agents nationwide to counterterrorism duties, and a related sharp decline of investigations into white-collar crime, police abuse and civil rights violations," Shukovsky and Lathrop report. "The number of federally licensed firearms dealers has fallen 79 percent nationwide since 1994, when Congress passed " new gun-control measures that still spark fiery debate," reports Michael Doyle of the McClatchy-Tribune News Service. "In 1994, there were 245,628 U.S. residents holding federal licenses to sell firearms," Doyle reports from Washington. "Now, there are 50,630 of the so-called Type 1 federal firearms licenses nationwide. "The decline in licenses began after Congress approved in 1993 the so-called Brady Bill, named for former White House press secretary James Brady, who was wounded in a 1981 assassination attempt on President Reagan. The 1993 law, and a subsequent 1994 anti-crime law, imposed new restrictions." Firearms licenses now cost $200 for three years, not $10 for one year, and "applicants now must submit photographs and fingerprints and inform local police of their plans. In many cases, those losing licenses were so-called 'kitchen table' dealers, who operated from their homes rather than from formal storefronts." "Frontier and rural health care providers looking for innovative ways to solve increasing workforce shortages are sometimes finding that help is as near as their own backyards: by recruiting and training local people to be health care professionals in their communities," reports Candi Helseth in the Summer edition of The Rural Monitor. The story cites examples from Nevada, Alaska and Maryland. 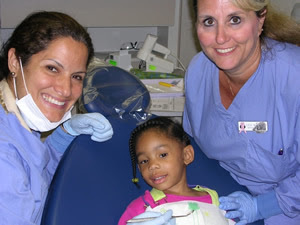 In the photograph, Dr. Christine Alarcon, left, and assistant Lisa Windsor treat a three-year-old patient at the only dental clinic for low-income children in Dorchester County, on Maryland's isolated Eastern Shore. Community groups "negotiated a deal with Alleghany College in western Maryland to reserve two spots for Eastern Shore students in its dental hygiene program. . . . Students were required to commit to practicing at least two years on the Eastern Shore." The University of Nevada "developed a medical student rotation program to introduce students to rural practice and, at the same time, provide more services to those communities," and directors of a frontier hospital in Alaska "picked up the bill for hospital employees to become registered nurses," Helseth writes. (Read more) The Rural Monitor is published by the federally funded Rural Assistance Center, a collaboration of the University of North Dakota Center for Rural Health, the Rural Policy Research Institute and the Office of Rural Health Policy in the U.S. Department of Health and Human Services. Intersections in northeastern Wisconsin were deadlier "than more congested urban intersections in recent years," Karen Lincoln Michel and Ben Jones report for Gannett Wisconsin Newspapers after studying state records for a 10-county area and the rest of the state from 1994 through 2005. About 80 percent of the 422 crashes at intersections were on roads the state classifies as rural. "Statewide, 70 percent of all fatal crashes at intersections occurred on rural roads," Lincoln and Jones report. Two reasons seem to be two kinds of speed: faster driving in rural areas, and fast suburban growth. "The speed at which traditionally rural areas are transitioning to far-flung suburbs, boosting travel pressure on narrow country roads, is outpacing government’s ability to make upgrades," they write. 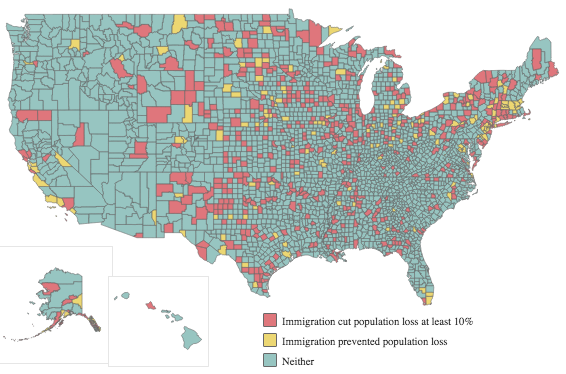 "Although the majority of deadly crashes happen on local roads, they get a minority of the federal funds aimed at preventing deaths."